Derma Seta is the professional, handheld mini skin spa that not only removes hair painlessly but also exfoliates your skin to make it softer and more radiant. With the Derma Seta, you’ll get all many of the benefits of those pricey spa skin treatments but without the expensive spa prices. It removes unwanted hair by using the derma crystal pads which the Derma Seta unit rotates up to 550 times per minute to provide painless hair removal. While removing unwanted hair it also polishes, exfoliates and buffers your skin to make them more beautiful. You no longer have to wax and pluck or waste time shaving. 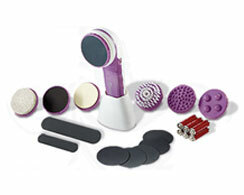 Plus the Derma Seta has 9 different attachments for a full body spa treatment. You can use the attachments to remove calluses, cleanse your face, massage your skin, exfoliate dry skin and more. The Derma Seta basic system includes the Derma Seta unit along with 9 different attachments. It costs only 2 easy payments of $29.95 plus the cost of shipping and handling. Or you can order the rechargeable Derma Seta system for 2 easy payments of $39.99 plus shipping and handling. The product comes with a 30 day money back guarantee. 12 Comments on "Derma Seta"
what’s the difference between the rechargeable and the basic system? The basic system uses regular akaline batteries. The rechargable unit has a built in rechargable battery. Please tell me how to buy the derma seta online for a delivery destination in New Delhi, India. Hi, does the hair come back thicker or thinner after using the Derma Seta? Is this product Derma Seta available in Mauritius or can I order it online and have it delivered to me by courier? Is Derma Seta Available In Pakistan???? Is derma seta avilable in middle east? Can u plz tell me how to order this product??? Is it available in mauriTius n where? ?